Non/Disney Heroines. Non/Disney Heroines. HD Wallpaper and background images in the heroínas de caricaturas de la infancia club tagged: non disney disney heroines. This heroínas de caricaturas de la infancia fan art might contain vitral. Okay I know most of these girls but I don't all of them. Top row: Amalthea, Akhesa?, Eilonwy, Marina, and Irene. Second row: ?, ?, Greta, Kida, and Tuptim. Third row: Kayley and ?. Fourth row: Is that Clara?, Yum-Yum, Daria, Molly Gru, and Thumbelina. 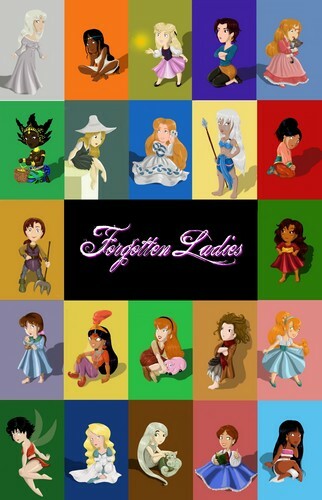 Last row: Crysta, Odette, ?, Anna Leonowens, and Chel. Okay. Thank you. You have opened me up to a whole bunch of movies I didn't know existed before. The movies are The Last Unicorn, The Princess of the Sun, The Black Cauldron, Sinbad Legend of the Seven Seas, The Princess and the Goblin, Kirikou and the Sorceress, The King and the Mockingbird, Little Longnose, Atlantis The Lost Empire, The King and I, Quest for Camelot, Mia and the Migoo, The Nutcracker Prince, The Thief and the Cobbler, The Princess and the Pea, Thumbelina, Ferngully The Last Rainforest, The Swan Princess, The Secret of Kells and The Road to El Dorado.